Wireless Vantage Vue Station, Kosmos Scientific de México, S.A. de C.V. 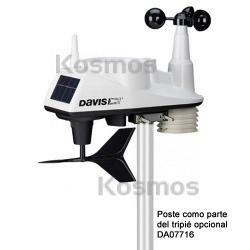 The new Davis Vantage Vue weather station combines Davis' legendary accuracy and rugged durability into a compact station that's easy to set up and use. Vantage Vue includes a sleek but tough outdoor sensor array and a distinctive LCD console. Its unique Weather Center function provides additional information on each weather variable. In addition, Davis has made Vantage Vue radio-compatible with our flagship Vantage Pro2 professional stations so you can mix-and-match most components.